Dave and I have a bunch of entertaining ideas and tips for fun on your porch. 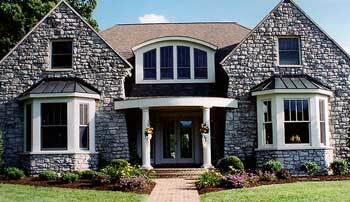 Porches are fantastic spaces for entertaining friends and enjoying activities with your family. How about hosting a graduation party on your porch? Think of your porch next time you want a fantastic place to host a festive porch party, a romantic dinner, play board games, or read with your children and grandchildren. Imagine yourself enjoying dinner at this bistro set. How nice that would be with someone you love. 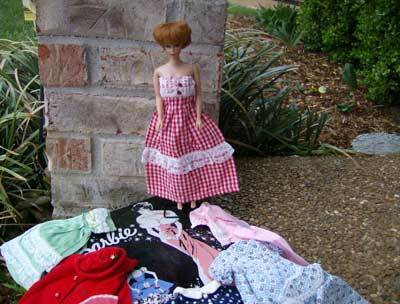 This photo was taken at Brown Woods Farm in Lexington, KY and is included in the beautiful book, Perfect Porches. Notice the picnic table that serves as a contemporary drinking bar. The wonderful summer flowers and basket of hedge apples are just the icing on the cake. We love the outdoor curtains, too. They look so wispy floating in the gentle breeze. And romantic too! This is just one of the hundreds of spectacular outdoor spaces featured in the book Perfect Porches by author, Paula Wallace. 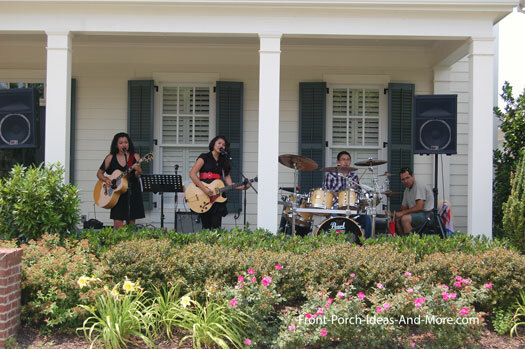 Ever Been to a Porchfest? Porchfests have not been around for long. The first one was in Ithaca NY in 2007. Get the scoop on Porchfests that we have heard about in the US and Canada. There have been many country songs written about porches and porch swings. Mary and I found some that we know you'll enjoy listening to. Check them out here! Think of your porch next time you want to enjoy the best ever homemade lemonade. 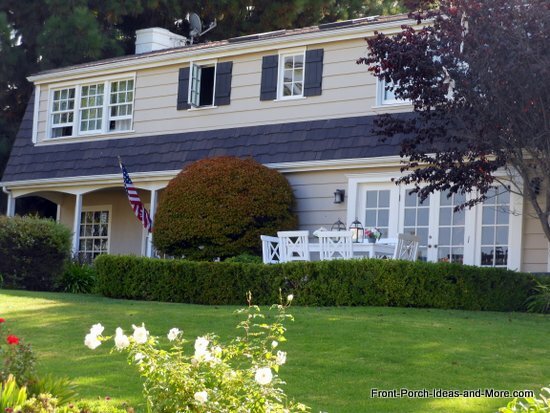 Dave and I lived in a big country-style house when our sons were in high school. We had a large country porch. We decorated our front porch with purple and white streamers, their school colors, when they graduated and entertained their friends and family on our porch. It's a great memory of ours. This wonderful outdoor space has a living-room feeling - even a TV! Ever listen to old-time radio? The Lone Ranger, the Green Hornet, The Shadow or the Mystery Theater? 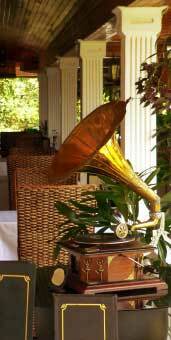 Or how about listening to old time radio shows with your family? When was the last time you and your family enjoyed some time together without the TV or video games? The Golden Age of Radio began in the early 1920's and television overtook it in the 50's and 60's. According to a study, 82% of Americans listened to the radio during that time frame. Old time radio are shows from the initial days of broadcasting. Dramas, westerns, mysteries, comedies and variety show scripts were read and acted by professional actors. Believe it or not, families would sit around the radio and listen to the shows the same way we sit in front of television now. Listening to radio forces you to use your imagination. It's just another entertaining idea for your porch. Get comfortable on your porch swing or rocking chair and veg out for a while. 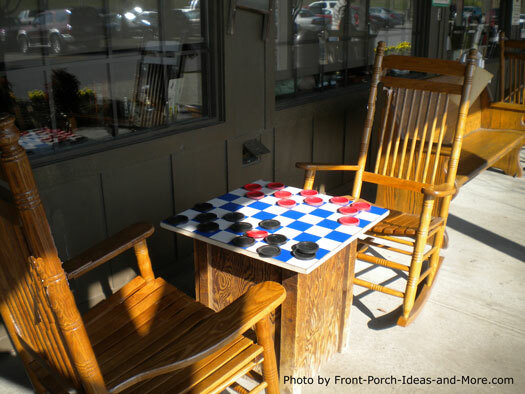 See our front porch board game ideas - like checkers, chess, or pinball on the porch. Just about any board game is fun on the porch. 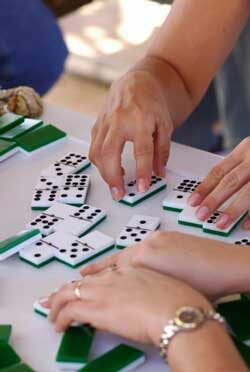 Have a Scrabble night with your neighbors or your grandchildren. 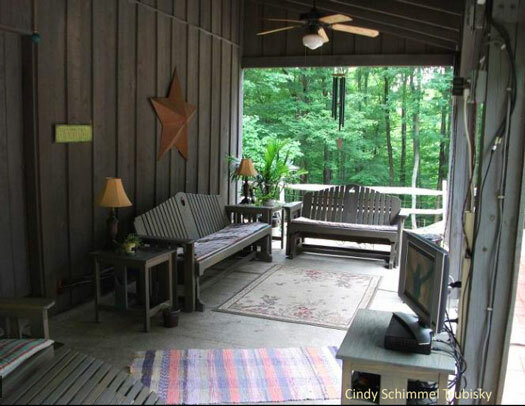 Porches are great places to catch up on your favorite book. We'll share some of our favorites. With today's technology innovations, you can recreate the outdoor movie experience right on your porch. Need additional space for exercising, stretching, or for meditation? Turn your porch into your training space unless it's December and you live in Buffalo [grins]. Look at the lovely table on the front patio. Imagine the meals you could enjoy here. Plan your serving and seating arrangements for your guests. Ever thought of making your own organic wine? 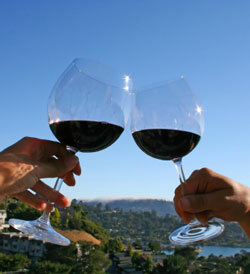 There are fantastic health benefits in drinking wine, especially red wine. 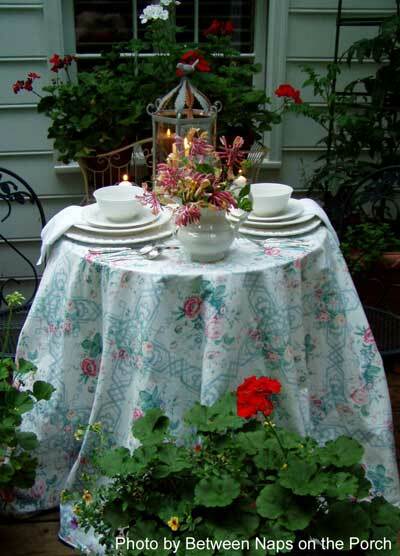 A wedding - a small, intimate garden can be planned around your porch and your yard. We have some super ideas for you. Do you have nice memories from the porch? That was a question we asked our readers and they shared their memories of the porch with us. 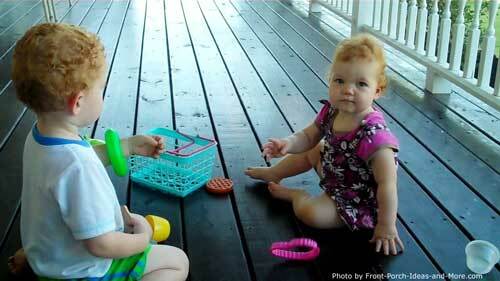 "You will never regret having fun playing games on your front porch." My Mom and Dad would sit on our porch and watch the neighborhood kids play in the yard. I also remember reading and coloring on our porch swing. 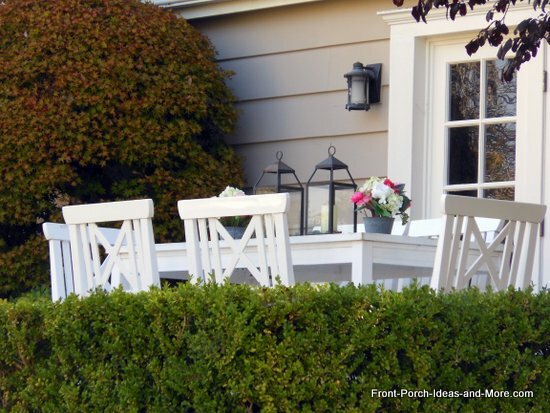 "Porches are a relaxing place to read a novel or the morning newspaper. 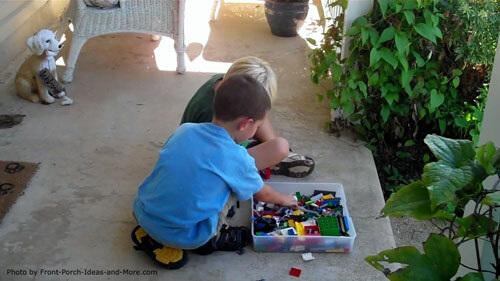 Our grandchildren like to play with legos® and super heroes on their porch. Just imagine the nice memories they are making." Today, kids and many adults often prefer playing video games in front of a large flat screen TV, but there's still nothing that can replace the social interaction you get with a board game. Here are some family board game ideas. We know that many of these games can now be played using technology but there's something to be said for sitting down and playing with someone else. Many of these porch games will one day become antiques. So, if you still have a monopoly game board, save it. You will one day show it to your grandchildren and it will be a real novelty. "Doesn't take much to make kids happy!" What's more memorable and charming than an outdoor wedding on a beautiful porch? 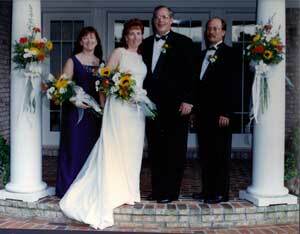 Our friends, David and Laura, were married on this beautiful porch on the evening of July 5th, 1997. Their wedding was very fun and relaxed. 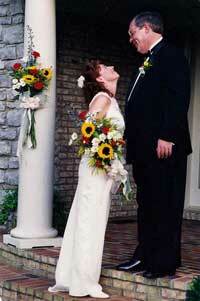 Their wedding vows were exchanged on the steps of the porch. Here you can see wonderful photos from that special day. Laura and David's reception was a big picnic with picnic baskets on the tables filled with wine and fruit. They had fried chicken, corn on the cob, watermelon - all the fixings you'd expect on the 4th of July. Kids were given Mason jars to catch lightening bugs. What a sweet memory. 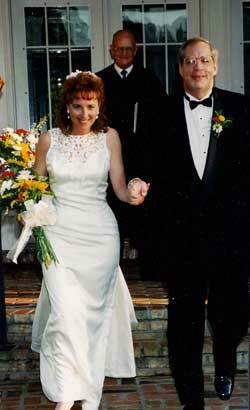 We thank Laura and David for sharing their beautiful memories and photographs with us for everyone to see. What a charming location for a wedding - on the porch of a good friend. Have a back-up plan. 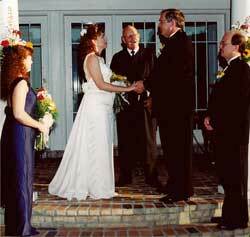 It's always a good idea to plan you wedding near a facility that can handle the same amount of people attending. A porch wedding is ideal as everyone can slip inside in case it rains. Tents can be also be used but make sure they are sturdy enough to withstand moderate winds. Place tents strategically so as to allow water to run out of the tent - not into it. Have large outdoor fans available to keep air moving and your guests comfortable. Provide cover from the sun. 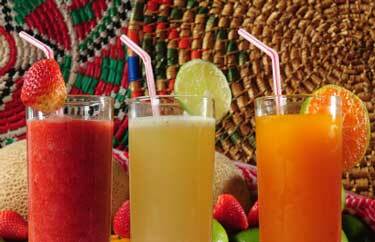 Have plenty of water, iced tea, and other cold drinks available. If outdoors in colder weather have portable heaters and lap blankets available. Make sure everyone can hear the wedding ceremony - have portable speaker systems available and test them just before the ceremony begins. 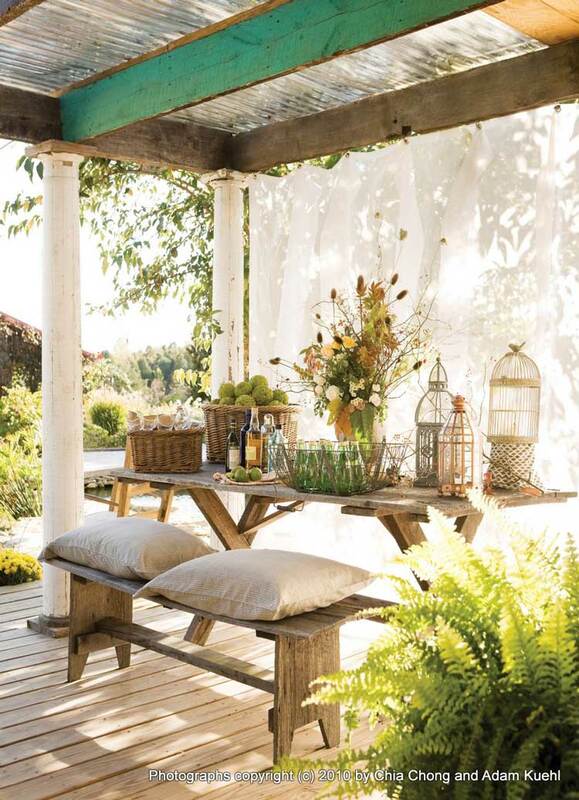 We hope you found some nice entertaining ideas for your porch here. Go and enjoy yourself.